Pedal confusion and storefront crashes are two problems that may sound unusual but are unfortunately quite common and often go hand-in-hand. As an Oakland car accident lawyer, Attorney Greg Brod helps people injured in these accidents. As a concerned and safety-conscious member of this community, he is also dedicated to helping raise awareness about the dangers of pedal confusion, the relationship to storefront/building crashes, and ways to prevent these tragedies. ABC7 reports that a vehicle plowed into the Walnut Creek Panda Express located on Oak Grove Road just before 5 PM on Tuesday. A Contra Costa County Fire official told reporters that it appears the elderly driver hit the gas instead of the brake while attempting to park in front of the restaurant, causing the car to accelerate into the storefront. The driver was taken to the hospital as a precaution but thankfully there were no serious injuries reported. According to ABC7, this was the third accident of its kind to occur in Walnut Creek in just one month’s time. On February 2, a pedestrian was injured when an older driver crashed into a CVS in the Countrywood Shopping Center. On February 18, pedal confusion appears to have led to a car plowing into the Ignacio Valley Road Sports Basement. 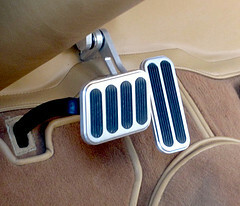 In a Safety Advisory from May 2015, the National Highway Traffic Safety Administration (“NHTSA”) explains that pedal error crashes typically take one of three forms: 1) A driver intends to step on the brake but steps on the accelerator instead; 2) A driver’s foot slips from the edge of the brake pedal onto the accelerator; or 3) The driver intends to brake but instead steps on both the accelerator and the brake simultaneously. Pedal error crashes can cause sudden, full-throttle acceleration and most often occur with vehicles that had been travelling at a slow pace, often when the driver is trying to park in a lot or driveway. Drivers often do not have time to correct the error and are unable to prevent a crash. The NHTSA notes that drivers under 20 and over 65 are involved in pedal confusion accidents about four times more often than other drivers, but the accidents can and do involve drivers of all ages. Perhaps surprisingly, the NHTSA found that pedal error accidents occur up to 16,000 times every year in the United States. That means there are approximately 44 pedal error accidents on any given day. A Media Advisory released by the Storefront Safety Council, an organization focused on to studying and preventing vehicle-into-building crashes, reports that motor vehicles crash into storefronts, offices, and commercial buildings 60 times every day. These accidents lead to more than 4,000 injuries a year and cause as many as 500 deaths annually. Notably, these figures do not include crashes into residential properties. Looking closely at reports of more than 10,000 storefront crashes, the Council found that 34% of the incidents (the largest percentage of any cause studied) involved pedal error. Retail stores accounted for the largest share of the studied site locations at 25% with the second-highest identified group being convenience stores at 21% (“Other” accounted for 22% in the site identification review). Be familiar with your vehicle and adjust the seats, mirrors, wheel, and pedals appropriately. Take note of the location and feel of the pedals when driving an unfamiliar vehicle. Aim for the center of the brake pedal every time. Avoid distraction and stay focused on driving until the vehicle is parked and the engine is off. Exercise caution and proceed slowly when entering and exiting parking spaces. Wear proper footwear. Flat-soled, lightweight shows are best while flip-flops, high heels, or heavy boots may contribute to a pedal error accident. Given the statistics, these tips likely apply to avoiding storefront crashes as well. We would also remind people to regularly assess their own and their loved one’s driving ability, particularly as the driver ages. As we’ve noted in prior blog entries, slower reflexes, medical issues, and other issues associated with aging can contribute to accidents of all kinds. If you have been injured in a storefront crash and/or pedal confusion accident in Northern California, we can help. In addition to potential claims against the driver, claims against the automaker (e.g., if the pedal configuration was unsafe), the property manager (e.g., if there was a history of similar accidents or near-accidents at the location), or other parties may be appropriate in certain circumstances. Call our Northern California pedal confusion accident law firm in Oakland, Santa Rosa, or San Francisco to arrange a free consultation. Time is of the essence so don’t put off the call.